↑ 1,0 1,1 1,2 1,3 "Pastscape-Detailed Result". English Heritage. Retrieved 7 October 2011. ↑ "Exploring London : Marble Arch". Exploringlondon.wordpress.com. Retrieved 2013-08-11. ↑ Timbs, John (1868). and Westminster: City and Suburb. London. pp. 190–91. ↑ Cunningham, Peter (1850).Handbook of London: Past and Present. 1. London: John Murray. p. 511. ↑ "A Little Talk About Buckingham Palace". Sharpe's London Magazine. 13 (4): 355. 1847. ↑ "Coronation route". Retrieved 2011-09-21. ↑ BBC. "Marble Arch to Edgware". Retrieved 20 July 2012. 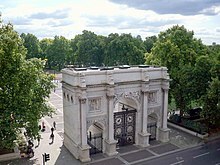 ↑ "Marooned Marble Arch may be moved". BBC News. 2005-02-28. Retrieved 2011-09-21. ↑ Smith, Denis. London and the Thames Valley. London: Published for the Institution of Civil Engineers by Thomas Telford, 2001. Print.